Dubrovnik. UNESCO World Heritage. You should visit its walls, its streets, its harbor… and take the boat that in 15 minutes will leave you in Lokrum. All calmly, leaving filled with the quiet pace of its people, enjoying a coffee in one of its endless terraces, losing by the narrow streets of the west side… From Dubrovnik you can make trips to various islands in the area: Lopud (with a beautiful white sand beach, too busy for my taste, but very nice), Šipan, Koločep… Multiple agencies in the port of the old town offers day trips to these islands, although I do not advise in this way, because it forces you to spend all day in the same boat and the same group of people … Best from the new port (Gruž) take a ferry line, cheaper and more independent. From the new port, you can also take a fast ferry to Mljet, leaving in the morning and returning in the afternoon. Dubrovnik needs a quiet visit, so I advise to sleep in the old town. We can move from Dubrovnik to the various islands by ferry, linking the various islands: Mljet, Korčula, Hvar, Brač, to Split or do a combination of road and ferries, which can be more rewarding and less stressful. Here’s my proposal, which have already tried several friends and acquaintances and have always been surprised and delighted and looking forward to returning! Ston. The second world’s longest wall after the wall of China … Yes! It’s true. You can also visit the salt flats, oyster’s marine farms … and Mali Ston, a small wonder, where in addition there are good restaurants. Before coming to Ston remember to stop in Mali Ston. And do not forget to try the oysters of Ston! Mljet. This island contains within it a beautiful protected natural park, which can be visited. With an island within the island. All very well organized. 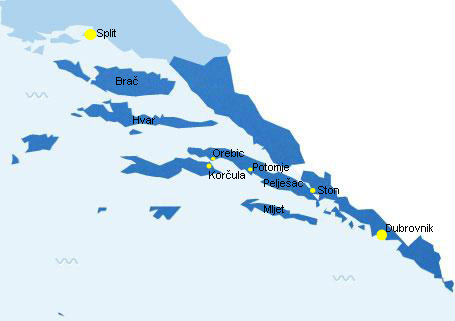 You get to the port of Polače by ferry from Dubrovnik or from Trstenik (on the peninsula of Peljesac). On this route that we are doing we will do from Trstenik. You go on boarding on Trstenik without a car, because the boat is small and we arrive to Polače. A hundred meters from where we left the boat is the gatehouse at the park, where you can buy tickets for access and a van will take you to the park. You can also ride a bike or going on foot. I advise that if you want to rent a bike, better do inside the park. Inside the park also circulating boats to take us to the island within the island. Area classified as the best wine in Croatia (Wine DINGAČ), you can visit Potomje wineries, and Dingač wine area, with beautiful hillside vineyards leading down to the sea. Do not miss it. In Vela Luka you can take the ferry to Hvar. Hvar. Although the ferry will leave at Havar city, you should also visit Stari Grad. Brač. Multiple options for getting to Brač. From Hvar or from Split. Split. Ending the route in the palace of Diocletian, from thousands of years of history and thousands of people still living in it, is a dream. What else can I say? You must discover it. But besides history, Split has a frenzied pace, with ferries coming and going continually to Brač, Hvar, Korčula, … and at night a great atmosphere! From Dubrovnik there are many possibilities for visiting Cavtat, Konavle area, Herzegovina, Mostar, Sarajevo (Bosnia), Kotor (Montenegro) … but i will explain this in another time. If you have comments, questions or need opinion, write your comment and I will try to answer you as soon as possible. Hi we staying in Hvar or Korcula in June 2014, is it possible to catch a ferry from Korcula or Hvar on the 27 June 2014 to Dubrovnik? Or must we go back to Split and rent a car to drive to Dubrovnik? Usually there are ferries between HVAR and KORCULA (city of Korcula) or VELA LUKA (another city in the island of Korcula). This is the best option. From city of KORCULA you can arrive to Dubrovnik by car in 2 hours, but first you have to take ferry from city of KORCULA to OREVIC (30 minutes). Departures are very frequent every day.